Qualifying as a Solicitor in September - when should I start looking? Newly Qualified Solicitor in September - when should I start looking? This is a question we are getting asked every day at present by NQs calling. Our usual advice is to register with up to 3 agencies around now or at least in the next month (we would prefer you just to register with ourselves of course - or at least giving one agent a couple of weeks before contacting others), and not to panic until August if you havent got a post lined up (you then need to start some serious searching!). This relates specifically to solicitors on the high street and in the regions - we know a lot of the agencies produce wonderful glossy pamphlets telling you all about the salary you should be expecting, but the vast majority do this based on their experiences with the larger practices, not the smaller varieties we deal with, and most of the bumpf I have read tends to be irrelevant. Secondly, have a careful think about what you want at PQE level - are you really looking for a post in conveyancing, or is your ambition to get into another field - be careful you dont make the wrong decision - it is very hard after 12 months etc.. to move out of your area and into another one. Thirdly, send your CV through to us - we can see whether there is anything ongoing at present, and also keep you updated with legal jobs coming in. Legal recruitment is a bit of an art in itself - often we get hints and knowledge from insiders telling us where posts may be cropping up. Your details get added to our databases (anonymity assured) for firms to search as well. Finally, don't jump at the first offer coming your way - think carefully about all options. It doesn't pay to take anything that comes in, although if the post feels absolutely right, the money and location are good and you would be mad to turn it down, then you may well do! Labels: Newly Qualified Solicitors - when should I start looking? 22.03.07 If I am looking for a training contract, how many firms should I be applying to for work? Potential trainee solicitors often worry that they are either applying for too many training contracts or too few. It is one area that people seek assurance on. This is how we deal with it: firstly we ask what degree classification the person has - if you have a 2.1 or 1st and went to a good university (I could write another article on the latter!) with good A levels, a consistent academic background and a bit of work experience in a legal setting, you will probably find you do not need to apply much further than the big London firms and regional practices who advertise everywhere and anywhere, and you obtain interviews fairly rapidly for a good guess. So the answer here would be probably a first wave of about 10, followed by more if required. If you got a 2.2, or have an inconsistent background, perhaps as a mature student, and dont really fit into the standard requirements of the larger practices or commercial firms, you will probably have to widen the net - if you set on trying for the Magic Circle and commercial firms, you may have to do over 50 just to get one interview if that. If you are open minded about where you should be looking, you will also make a load of applications to high street firms. It is not unusual for someone with a 2.2 or 3rd to perhaps make over 100 applications, and if they are looking in the wrong place to then wonder why no interviews have been forthcoming. You have to be aware of who you are, where you are looking to end up, and what you have that a firm will be wanting. If you do not have sufficient skills or background to offer, chances are some or all of your applications will be a complete waste of time. Careers advisers are good to discuss things with (if they are geared up to it and know their "stuff"). 21.03.07 Budget - no good for alcoholic, 4 by 4 driving, solicitors on the high street! Budget day today, and we have just noticed what effect this will have on lawyers at smaller to medium firms. Firstly, getting to work will mean extra money paid out, especially if you drive a 4 by 4 (up to £300 extra I think! ), and you will probably get angry client farmers telling you how unfair it is for them as well! Once you are there, you will be horrified to discover that if you are a limited company your tax will have gone up from 19% to 22% over the next few years, but that if you get up to 1.5 million in profit you will find your tax going down (makes great sense!). At lunchtime when you pop out to down your first bottle of wine, you will find the cost has gone up by 5-6p, and when you smoke your pack of Bensons this has also gone up. When interviewing for a job, it is important to see things at all times from the employee's perspective - they will almost certainly be trying to guess what you are wanting, thinking and going to say to them and will want to get certain things confirmed about your firm before they commit themselves. This is particularly so when interviewing candidates who want or may want flexible hours or part time arrangements. The legal profession is notorious for its attitude towards anyone who dares to want to work less than a 40 hour week - and particularly so against women with kids. Some firms almost shy away from the whole idea instead of thinking about the benefits to them of having staff on flexible hours, particularly in small market towns where the Ten-Percent candidate database is not particularly bursting at the seams. I have heard recently of an interview where a partner of the firm indicated to a female candidate who would possibly have had children that flexible hours would not be possible, when in fact his firm offered flexible and part time roles fairly regularly. He was not thinking of this from the candidate's perspective at all - and in fact was going against what was standard policy at his firm! My wife once interviewed for a GP post in Shropshire, and the partner there took great pleasure in telling her what long hours they all worked and what money they made as a result. This put her right off - he should have guessed what she may have been thinking - children possibly on the way soon and hence my wife would not want to be in that type of environment - she would be looking for something where she could work less hours and not be so bothered about the money. Recently I have had dealings with a firm who are very well known and established, and have a good reputation in the market place. However the firm have made an offer to one of our candidates, and pushed slightly too hard, such that the candidate rejected the offer. I should start by saying that I understand entirely why firms would want to put a deadline on an offer and also push a candidate to get a decision one way or the other, and all recruitment consultants have dealt with those candidates who claim to be thinking about it but in reality are not bothered or using the offer to ramp up their salary at their current firm. However, as soon as a firm sticks a time limit on an offer I can almost always see the writing on the wall - either the candidate will reject them immediately on the basis that they wouldn't want to work for a pushy employer, or the relationship between the candidate and the firm will be shortlived - the candidate will always remember that they were pushed by the firm, and can bear a grudge! A better way to deal with the situation is to set a deadline from the outset, and then after that date indicate that there are other candidates out there who you need to interview. This is less confrontational, and can be the gentle nudge needed to push the candidate into making a positive decision. After working in recruitment for a number of years you do start to get a sense of deja vu! We often get very senior solicitors and executives registering with us, and needing to make an application for work after many years in the same post and wondering what on earth they need to do. Very often they send a CV through which is for about 1/2 page, and just says name, address, name of current firm, title and references to be supplied on request. It goes back to my comments below about solicitors requiring respect and status for all their hard graft, and why should they have to produce a long winded CV to explain who and what they are? Unfortunately, this often counts against them, unless the firm they are applying to knows them. There have been cases where we have sent such CVs through and had nothing from firms, followed by a full CV after much cajoling and suddenly interviews are being arranged. Anyone who finds themselves in this position when searching for legal jobs after being a solicitor for so many years can either use a service like our careers centre, where you pay us to prepare a CV (which of course still requires significant input from you) or alternatively sit down and write a covering letter and CV to send out. It almost always pays for itself in the long run, as not only does it explain who you are, it also helps to focus your mind on making sure you present yourself well to a firm. In a nutshell, what recruiters are looking at for such senior roles is firstly your geographical locations to date, your experience and outline of cases and involvement, the value of your following if any, your billing levels and your marketing and fee generating ability. If you bear this in mind when preparing your CV you shouldn't go too wrong! 14.03.07 Employing good receptionists in law firms - why should we? One of the easiest ways to spot a firm who are good to work for and who have a good working environment is to phone the receptionist and ask to speak to someone. Some receptionists consider this a real nuisance, and I have even heard sighs and tuts as if you shouldn't really be calling to speak to anyone at that particular time. I have also phoned one very well known practice, and been told before even identifying myself as an 'orrible recruitment consultant (rather than a solicitor or client) to call back in 10 minutes as they were busy followed by a click as they hung up on me! It doesnt take much to teach good telephony skills, but not only must you do this, but also be aware of the need to ensure that the receptionist is happy. If you have an unhappy receptionist - perhaps you are paying them £11,000 per year and this is causing them immense personal difficulties on the financial side, or perhaps you are horrible to them when they put calls through to them, the office they sit in is freezing or the chair too uncomfortable - they are going to pass this onto your clients. If your clients speak to someone who is frankly rude and obnoxious, chances are they may not want to use your services again. I called 4 firms for conveyancing quotes some time ago to see what their service was like. Out of the 4, 3 had receptionists that would probably have answered the local chipshop telephone more efficiently and politely. The other explained that she did the conveyancing herself as the partner didnt have time and gave me an immediate quote that was probably about half as much as it ought to have been! Think - a lot of solicitors are getting onto the marketing side of things, but smaller high street practices still havent grasped some of the essentials. Slots available throughout the day. 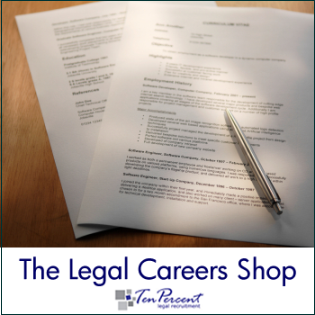 Come and discuss your careers options in the legal profession with a qualified solicitor and recruitment consultant - we can do practice interviews, cv advice and reviews, careers guidance and assessment and all matters are sent through as a report at the end, together with ongoing careers guidance for a further 3 months by email. Application Forms - Solicitors detest them! 13.03.07 Application Forms - Solicitors detest them! It has become the industry standard that once you are past the training level of the profession, the way to apply for the vast majority of posts, apart from local authority ones, is via a CV. In fact, most firms who have tried to use application forms for posts have met hostility from candidates, whether they realise it or not, because so many have filled out those long waffly forms you see for training contracts that have taken hours of work for no effect at all! Why should I, as a fully qualified solicitor, bother filling out a form? My work is obvious and my worth to the firm clear. A lot of the HR people at the larger firms do not realise the professional status solicitors place on their work, and why they are prepared to do the job. Solicitors study and train for over 6 years to get to where they are, and if on the high street they can be earning less than a supermarket shelf stacker. They have to have some self-worth there, and this is with the status of solicitor. I know - I am one, and when I qualified, I didnt care that I was earning less than a lorry driver - I was a solicitor, and no-one can ever take this away from me (unless I rob a bank etc..!). Solicitors like to command respect, and this is one of the ways they do it. I have had a candidate walk out prior to an interview because a firm wanted to get her to fill in an application form before seeing them, and she felt that she did not want to work as an office cleaner! What Benefits should I ask for as well as Salary at legal job interviews? What benefits should I ask for as well as a salary? The choice of benefits varies quite considerably, but you need to know why firms will like or dislike them. When that time of the year comes up when you actually get to discuss your salary and package rather than just thinking about it, it is important to have all the facts to hand. You can find an article about annual reviews on our website at www.ten-percent.co.uk/careers_centre_lawyers.htm, but in particular what should you do about benefits in addition to salary? Firstly you need to understand their relevance. Firms like benefits because often they include some tax reduction benefit to the firm - usually the Customs & Excise website has details of this - www.hmrc.gov.uk . It is often the case that some benefits receive a different treatment when it comes to National Insurance payments. We have come across benefits including annual gym membership, life insurance, critical illness cover, death in service cover, health insurance, golf club membership, parking permits to cover a city centre car park, access to a discretionary trust to receive specific bonuses, extra annual leave, flexible working including a computer at home and broadband costs covered, additional annual leave swapped for evening and weekend cover, pension contributions (access to a stakeholder pension isnt really a benefit despite some firms best efforts to persuade otherwise!) with a range being from about 2% up to a 12% contribution, car loans, relocation packages, leaseback car arrangements, clothes allowance, and others I cannot think of at present! Labels: What benefits should I ask for as well as salary? 07.03.07 - Is an interview the best way of assessing a candidate? In a recent article in the Recruiter Magazine, Stephen Davis argues that a better approach would be as follows: (1) give full specifics of your post prior to interview - this can sometimes be very frustrating in legal recruitment - firms give very vague requirements and are surprised when candidates get annoyed at travelling a long way to find the post to be inappropriate!, (2) each candidate asked to supply a CV and personal statement, complete an online personality test, complete an online numeracy and verbal test, provide evidence of professional qualifications (not really relevant for solicitors) and a written response to a specific legal/business issue. This sounds like a good idea - apart from the online tests, which most lawyers would be horrified by! (3) information assessed by external recruiter and (4) preferred candidate chosen to go forward - meeting colleagues to be working with, (5) task set for the solicitor to undertake to prove their mettle and (6) meeting to negotiate terms of employment. This is a very thorough way of undertaking recruitment, and I can see the merits. I am not sure a lot of firms would want to spend so much time on it, and also if there is only one candidate for a post and lots of firms after them, I am not sure a candidate would be overjoyed at the process! However, I cannot emphasise enough that if a firm provide good info to agents, the quality of candidates supplied can be much better (although the quantity can diminish).